Madam Sherry Ayitey, Minister of Fisheries and Aquaculture, has commended the Korean government for her role in the Ghanaian economy. She said the Korea International Cooperation Agency (KOICA) had helped in promoting cultural cooperation through people-to-people exchanges; sustainable development; and local ownership of development projects by Ghanaians at the grassroot level. Madam Ayitey made the commendation at the reception marking the National Foundation Day of the Republic of Korea in Accra. She said some of the landmark projects which have been executed in Ghana under the Economic Development Cooperation Fund and KOICA included the Petroleum Storage Depots, LPG Cylinder Manufacturing Plant and the Buipe-Bolgatanga Pipeline. She said the latest initiative was the project for Wa Water Supply System Expansion being executed at the cost of 55.5 million US dollars. Madam Ayitey said these projects were making significant contributions to the well-being of the Ghanaian economy. She said the traditional bonds of friendship and cooperation forged at the political level has greatly manifested in the steady growth of the economic cooperation between the two countries. ?We believe that the early conclusion of the ongoing negotiations for Bilateral Investment Treaty (BIT) will further deepen our strong economic ties by way of attracting more Korean companies to avail themselves of the favourable business climate in Ghana,? the Minister said. Mr Kyun Jea-min, Korean Ambassador to Ghana said the relationship between Ghana and his country has entered an unprecedented stage in which Korean companies were opening more business branches and seeking other opportunities in Ghana. He said last year the bilateral trade between the two countries recorded 392 million US dollars and that it was the highest and four times the size of that of 2005. ?Taking into consideration the complementarity of the economic structure of Ghana and Korea, our economic perspective is very bright,? Mr Kyun said. Mr Kyun mentioned some of the projects which have been successfully carried out through KOICA as the Accra Vocational Training Centre, Koforidua Auto-Mechanic Centre, the Dawenya Integrated Rural Development Project and the Akumadan Irrigation and Tomato Cultivation Project. He said there were many other on-going grant projects in the area of energy, health and sanitation, adding that: ?in effect, the cumulative amount of Korea?s grants to Ghana has grown to 30 million US dollars as of last year.? 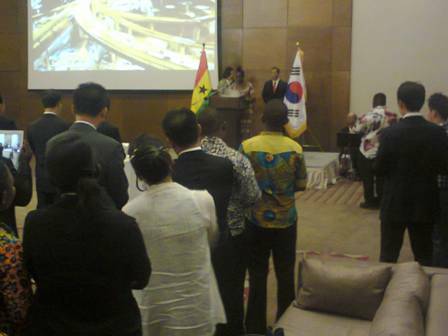 The diplomatic relationship between Ghana and Korea has been in existence since 1977 and had been characterized by the common desire to forge friendship and cooperation based on mutual respect and support for each other?s development aspirations as well as solidarity in pursuit of global peace, stability and security.